Sinful Colors notoriously has good Halloween and holiday collections. Sinful Colors is pretty much the only brand in the drugstore these days creating interesting nail polish even that is few and far between. I was happy to spot some cool colors in their recent Halloween collection. This one caught my eye. 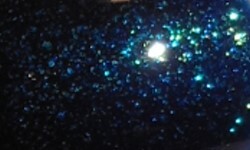 Nice Guise is a deep blue jelly with green,blue, and gold glass fleck glitters. Color: This is an impressive color for Sinful Colors! This color is rich, deep, but still vibrant. What I was worried about was that this color being dark would look black on the nails. Nope, this is definitely blue and that sparkle pops! Formula: This had a great formula. It was easy to use and applied nicely. I used 2 coats here. Overall: Great polish by Sinful Colors! The color is great and interesting. The formula is good and it's only $1.99!